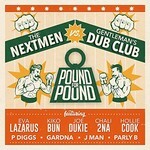 From UK-based Pound For Pound Recordings comes a remarkable collaboration album featuring The Nextmen and Gentleman's Dub Club accompanied by a whole heap of guest artists, who add their own flavours to the music created by the two iconic UK outfits. Probably better known in reggae circles than the Nextmen, this 2006 formed nine-piece dub band from Leeds has built a reputation for delivering energetic live shows. They've played for crowds at several big festivals including UK's Glastonbury, France's Telerama Dub Festival, Poland's Ostróda Reggae Festival, and Croatia's Outlook Festival, to name only four. In October 2013 they released their full length debut album "FOURtyFOUR" on Ranking Records, which in April 2017 was followed by "Dubtopia" put out by Easy Star Records. When it comes to influences they refer to people such as Iration Steppas, The Wailers, Misty in Roots, Twinkle Brothers, Scientist, King Tubby, Prince Jammy, Zion Train, Horace Andy, Vibronics, King Earthquake, and Ranking Joe. The 12-track album (10 on LP) expertly blends dancehall, dub, ska, reggae, roots and rap and is a real treat for the ears of reggae fans with a really broad music taste. Without any doubt they will highly appreciate tunes such as the outstanding horn-driven opener "Highs And Lows", which features Dallas Tamaira aka Joe Dukie, the vocalist of the New Zealand group Fat Freddy's Drop, and the infectious album closer "Pristine" featuring Eva Lazarus & Gardna, with the latter adding a nice dancehall vibe. And also in between these two tracks they are served very well with such totally entertaining tracks as "One Horse Town" featuring J Man, Kiko Bun's "County Line", and the previous single "Rudeboy", which features the vocal of the aforementioned Bristol lyrical wordsmith (Luke) Gardna. Nicely vibed tracks include Holly Cook's "Spooky (Love Affair)", Kiko Bun's "See You Next Tuesday", and "Misty Eyes" featuring Eva Lazarus.